Architecture as Icon is a catalogue of a joint exhibit presented at the Museum of Byzantine Culture in Thessaloniki, Greece and Princeton University Art Museum. Editors Ćurčić and Hadjitryphonos served as curators of the exhibit, culling artifacts from museums in Europe and the United States. This book and its related exhibit occurs in the recent epiphany of interest in the Art and Architecture of Byzantium, despite Gibbons’ portrayal in the Rise and Fall of the Roman Empire, in which the era with the largest time period was portrayed with minor and diminutive attention. Recent major exhibits such the Icons of Sinai at the Getty, The Glory of Byzantium at the Metropolitan in New York, and Holy Image, Holy Space: Frescoes and Icons from Greece at the Walters Museum in Baltimore are emblematic of this new interest in the Byzantine era. This project intends to revisit the importance of the elements of architecture and space in Byzantine icons and other representations rather than the focusing only on the holy figures in conventional scholarship. The book is a soft-bound but thick volume, divided into two parts, with the first comprised of a series of essays by the editors and additional contributors, and the second representing the catalogue of the Byzantine pieces. The items, including panel icons, models, liturgical ware, reliquaries, coins, and jewelry, were selected for their common incorporation into a built environment. The first chapter written by Ćurčić sets up the framework for the book, affirming the recent surging interest in Byzantine art by western scholars, and outlining the divergent developments of western and eastern representation and understanding of space. He reminds us, “for Westerners, art was a means of representing reality and at times even bettering it, while for Byzantines, art was never an end in itself, but a facilitator of access to the spiritual world, the indescribable, non-containable universe of the divine spirit” (7). An icon is not merely a picture or representation, but a window and a bridge to a spiritual reality. The essay goes on to present examples from the collection which illuminate a certain aspect of the icon, including a reliquary in the form of a Serbian monastery closed during Ottoman rule, which peasants used for prayer and adoration when not allowed to enter the church. Ćurčić also presents a very interesting and potent counterpoint between Masaccio’s Holy Trinity fresco, with its important one-point perspective, and a Russian icon of the Crucifixion. While the two pieces depict the same subject in a similar composition, Masaccio’s use of perspective draws the viewer into the space, which is divided into earthly and heavenly zones of cube and dome, with Christ mediating. The Russian icon places the Crucifixion in front of a planar wall of Jerusalem, providing a symbolic kind of division and an overall sense of infinite, uncontained space. Next he briefly describes the typical iconostasis of an Eastern church as an unfolded, condensed church building serving as an interface between the altar and the congregation, with examples such as panel icons which appear to be an unfolded map of a church interior, organizing the myriad saints and prophets in two dimensions. Additional essays explore a range of interrelated topics―symbolic interpretations of Early Christian architecture, with renderings of church architecture from mosaics of the period, and the idea of space in Byzantine thought, naturally taking the Trinitarian form of “earth, heaven, and beyond heaven,” corresponding to the three parts of the church―narthex, nave, and sanctuary. The fourth chapter explores the previously unstudied practice of architectural drawing and model making in Byzantium. Ancient orthogonal drawings and scale models had been known of in Mesopotamia, Egypt, and Greece, but continuous use could only be speculated. Sketches from Giuliano da Sangallo, Antonio da Sangallo the Younger, and Villard de Honnecourt are contrasted with a nineteenth-century builder’s sketch for a house in Athens, which to modern western eyes appears unrealistic or cubist, but demonstrates a different understanding of the organization of space and elements, and relies on the concept of time as an element in the experience of the building and the drawing. The second half of the book contains the catalogue of artifacts, including a polycandelon in the form of a church with the exterior and interior synthesized, thirteen-century stone models of church forms, architectural censers, and many icons which incorporate an architectural motif or structure, whether it be a single element such as a tower or saint’s shrine, or an overall organization of figures representing a church or a city. The catalogue is grouped into themes, from Generic Representations, Specific Representations, Symbolic Representations, finally culminating in Jerusalem, orienting the entire book towards that holy city and its liturgical meaning. It is in this section that we find the cover image of the book, the icon illustrating the Hymn to the Virgin, “In Thee Rejoiceth…” This Russian icon from the sixteenth-century served as a guide to the hymn within the liturgy of Saint Basil the Great, giving visual form to the priest’s silent prayers to all the ranks of saints. The base of the icon is a band of martyrs, saints, and bishops, looking up toward the central enthroned Virgin Mary with Christ Child, who are surrounded by the archangels in front of a multi-domed church and paradisiacal palm trees. 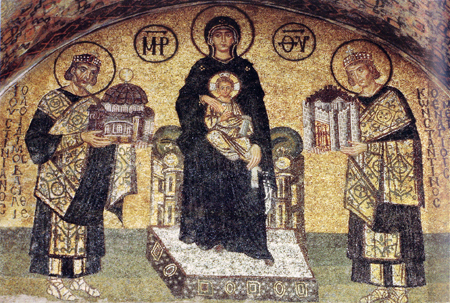 The image and its accompanying hymn intend to lift prayers from the earthly realm to the heavenly realm, transcending finite space and directing the sung hymn to she who is “wider than the heavens.” The icon, often thought of as a devotional tool, unites private prayer, liturgy, music, painted image, and architecture.